Probably, the command line that IDEA constructs is too long, but I don't see how I can workaround it. Tried to move JDK to shorter path (e.g. "D:\jdk") - same result. My configuration: Windows 7 x86_64, JDK 1.7.0_45, IDEA 12.1.6 UE. does javadic work for you from command line? What is hidden by the "Selected Files" scope? Of course, I checked that it works fine from the command line. Nothing is hidden under selected files. BTW, I tried multiple options (e.g. Current File, Uncommited Files with some active Change List), and neither of them worked for me. Exception is the same all the time. If nothing is hidden, then you try to run javadoc for empty set of files, is it really your case? What classpath do you pass to the command line when you start javadoc tool from command line? Seems that your project contains many dependencies and windows is unable to pass all of them in one command line. At the same time IDEA is unable to detect which one it should pass and which one - not. Anna, forget about Selected Files scope, I don't think it really matters. 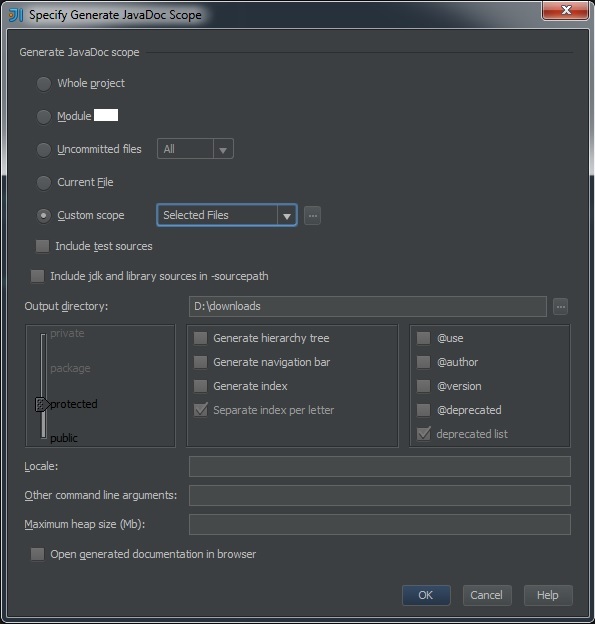 Let's say it fails (and it does) for Current File scope, and the only Java file is opened in the Editor. Also, I don't have CLASSPATH variable set on my env. I understand that the problem is in the command IDEA builds. How I can get it to review WHY it is too long? I was able to get the DEBUG log and found the command it tries to execute. Of course, it is too large because IDEA added a lot of stuf from local Maven repositorty to the classpath (see attached file). You wrote that: "Seems that your project contains many dependencies and windows is unable to pass all of them in one command line. At the same time IDEA is unable to detect which one it should pass and which one - not.". Probably, it is the case. I tried to provide empty classpath using Other command line arguments, but seems like IDEA ignores it because of IDEA-38250. What I can do to resolve/workaround this issue? I do want to generate the Javadocs from my IDE. UPDATE: I've created IDEA-116083 to track this issue, because I could reproduce it on multiple projects, and I don't see a workaround. You can use Long Path Tool for this type of issue. It remove the error- 206 . It reduces your stress for long filename problem.